Despite the lack of any approval from the other signatories of the Iran nuclear agreement, formally known as the Joint Comprehensive Plan of Action (J.C.P.O.A. ), President Trump on Tuesday announced the United States is leaving the agreement. Britain, Germany, and France tried unsuccessful to persuade Trump that the agreement was working and not to leave the deal. In his formal statement Trump said the agreement “is defective at its core” and is an “embarrassment.” He then signed a memorandum to reinstate nuclear sanctions on Iran. Trump’s address on the Iran deal expressed a number of falsehoods to make his case of why he was pulling out of the agreement. 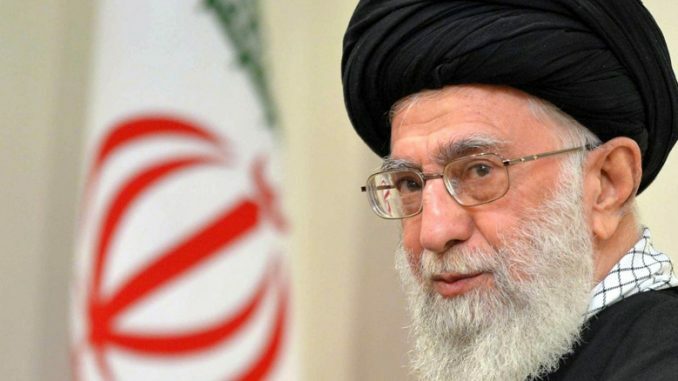 He stated, “Today, we have definitive proof that this Iranian promise [that Iranian nuclear technology was only for peaceful purposes] was a lie. Last week, Israel published intelligence documents—long concealed by Iran—conclusively showing the Iranian regime and its history of pursuing nuclear weapons.” Israel’s presentation showed nothing new that was not already known before the nuclear agreement was made and that information was considered before the agreement was ever signed. Trump framing the Israeli documents as new is a false narrative. Trump also tried to link Iran’s missile program and terrorist related activities as part of the original deal that was reached when the deal’s scope was solely on nuclear matters. “Not only does the deal fail to halt Iran’s nuclear ambitions,” Trump said, “but it also fails to address the regime’s development of ballistic missiles that could deliver nuclear warheads.” Trump is falsely trying to lump all outstanding security issues into the purpose of the agreement. He might as well be saying the deal also fails to address agricultural trade issues. Trump might have wished that during the original agreement missiles and terrorism were included, but in order for the nuclear negotiations to begin in the first place, those issues were put off to separate and future discussions. To pretend that a nuclear deal could have been reached with the inclusion of missile and terrorism agreements is revisionist fantasy. In the end, Trump’s reasoning of why he is pulling out of the J.C.P.O.A. wreaks of political rationale more than sober national security calculations. He is, after all, keeping a campaign promise by going back on the deal. It was a campaign promise made from a campaign without any significant foreign policy experts, and with a candidate who had absolutely no experience in international relations whatsoever. What is Iran’s reaction? Iran said after Trump’s remarks that it remains committed to the deal and will work with the other signatories but will resume uranium enrichment if they do not continue to benefit from the deal. That last part will involve how effective the newly restored sanctions will be. Since the other signers of the J.C.P.O.A. believe the deal is in fact working, this could cause a serious confrontation with allies. Is Trump willing to sanction Britain, Germany, and France over Iran if they continue to honor the deal? What ever Trump’s goals might be with pulling out of the Iran deal, the price is going to be extremely high. Besides giving up the best opportunity to track and limit Iran’s nuclear capabilities over most of the next decade (A new deal will not be renegotiated in the foreseeable future), Trump has yet again shown that America’s word is no good and will pull out of agreements it has made. This is something Kim Jong-un, who was also mentioned in Trump’s address, is most likely paying attention to with talks with President Trump only a few weeks away. At the very best, Trump’s decision to pull out of the Iran nuclear agreement is shortsighted, reckless, and supremely dangerous.